Sunday the 26th of March is Purple Day - it is a celebration aimed to raise epilepsy awareness worldwide, a condition that globally affects over 65 million people. However, did you know that dogs can be afflicted with this ailment as well? Up to six percent of the canine population suffers from a form of epilepsy. 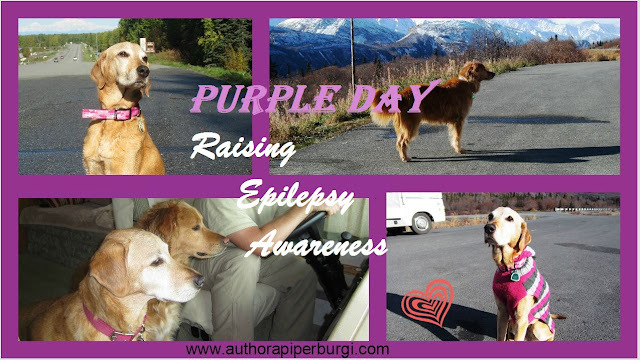 In fact, epilepsy is the most diagnosed canine neurological disease. This is only a rough estimate since many cases of canine epilepsy remain undiscovered by the respective canine parents as dogs often experience their fits when they are inactive, late at night or during the early morning hours. So, throw on a purple shirt and let's raise epilepsy awareness for all sufferers, human and canine alike! - Don't attempt to restrain your dog during a seizure. - Do not place your hand on or near your dog's mouth during a seizure. Dogs have no control over their bodies during an epileptic episode and will sometimes clench their jaws which could lead to an accidental dog bite. For more information about Purple Day, Purple Day events or epilepsy, please visit www.purpleday.org.